Formulation: Apricot kernel, almond and wheat germ oils balance the skin’s natural oil content, while anthyllis and carrot extracts calm the skin. Neem, St. John’s wort and calendula extracts combine to visibly minimize redness and help maintain a healthy, radiant complexion. OMG, I went thru such a crazy bout of adult acne from stress, that no other products were able to help. Got Hauschka’s Clarifying Day Oil & Clarifying Toner & literally I woke up & my skin was soooo much better! In two days, it’s a totally different complexion, acne marks are disappearing & I’m in love w my glow! The smell of these products so delicious also! Thank you?? I've been using the clarifying day oil (along w. the clarifying toner, and cleansing cream) for 2 years. This product has completely changed the size of my pores, and overall tone. Very effective in managing overproduction of facial oils. I love this day oil. I use it morning and night and my skin is soft, clear and lovely. I can not be without this day oil! Love Love Love! In a winter time for me is the best skin care product for every day. Sometimes I’m mixing with a Melissa day cream or just leaving alone on a T zone for balancing. Not a greasy very soft and perfect absorbing face care oil. Love all dr. Hauschka products. I love this product, it has cleared up my pimples. Ive been using it for two weeks and I will continue to buy it. It smells so good and helps keep my face hydrated. When I have a beak out I just dab a little on at night and it goes down dramatically by the morning! Love it. My 17 year old son is dealing with stubborn acne. 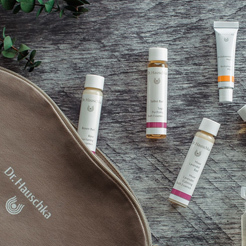 Dr. Hauschka’s products are the only ones that have helped. Using the Soothing Cleansing Milk, Clarifying Clay Mask and Clarifying Day Oil, he experienced almost immediate results. A must have for my skin! I’ve used the clarifying oil for about a year. When I ran out, my hormonal time of the month kicked in and so did the acne. I had been clear for a long time. Once I re introduced this product to my regimen, my skin returned to its blemish free self. This is a special oil that I use to balance my face if I'm too oily or dry. Really works! This is a must have in my morning skin care routine! This oil calms and moisturizers without being overly greasy. A little goes a long way and it smells great too! a little goes a long way! smells good and does help your face. If you put too much your face will be way too oily so be careful. I love the combination of using this with a mask. My skin glows! I have super sensitive but dry skin, prone to blemishing ever since having children and this it the perfect light weight moisture to balance all those conditions out at once! I love this oil and use it every single day! I love how dewy it leaves my skin feeling too! I have used this oil on and off for the past 4 years or so, and am always amazed at how well it works when I come back to it. Within one day of using it, my combination/sensitive skin is calmed and the shine is greatly diminished. It truly is the best product on the market. I have struggled with and oily t-zone most of my life, and now at 60, although dryer on other areas of my face, I am still very T-zone oily..especially when our weather begins to heat up! Mixing the Clarifying Day Oil with the Melissa Cream has helped a great deal! Battling breakouts after 26yrs. of age is difficult, and the harsh chemicals dermatologists recommend don't help or feel good on my already sensitive skin. Trying natural products typically causes worsening breakouts, as the "non-pore clogging" oils like jojoba and coconut don't deliver the right balance for moisture and calming my easily irritable skin, but this oil (when using 1-2 drops in the morning) does the trick. I've been using this for six weeks now and no breakouts. Have started receiving compliments on my skin now. That's amazing! This little travel version lasts a while. just two drops on the entire face works the magic. Also good as a more generous night treatment. Have been using it for ages and love it. This is a great everyday oil/moisturizer to use for skin that breaks out. I only use it when my face is really breaking out and it really helps. It is awesome. The best oil for my skin! This oil does minimize pores, by liquifying and helping the sebum in the pores to "melt" out and not stay too long in the pore and clog them. It is also a very moisturizing cream. Whenever I need a special moisture treatment for my skin, I use Firming Mask as a night cream, and then this oil during the day, over another cream. Works wonders for me! I normally have very oil skin but since Ive been living in MT my skin is getting drier. I combine a couple of drops of clarifying oil with Rose day cream (not too much) it moisturizes and makes my face so soft. I love the smell of roses and it lasts all day. I have been using this on my face for over 10 years. I was initially unsure about using an oil on my face to help with blemishes but I'm so glad I tried it! My face is extremely sensitive and this is the only acne treatment type product that I have ever been able to us. And it works! Also a bottle lasts me at least one year. It takes only a couple drops per use so it lasts a long time. I love this oil. Firstly, it isn't a very heavy oil. I've tried other brands of face oils in the past and they all tend to end up drawing moisture out of my face, because your skin stops producing its natural oils if you're bombarding it with heavy oil. This product doesn't do that. I use it every morning as part of my face care routine. I have found that when it comes to small blemishes, they clear up almost immediately! I had a small bump (like a pimple) for YEARS on my cheek that I was told I could remove by surgery, but I would have a scar. After applying this oil for just a few days- it was nearly gone! This is a must have product to add to your Dr. Hauschka collection! I was very skeptical to try this product but it has helped my sensitive combination skin. I find most products for blemished skin too irritating or drying for my fair skin. Given time, this has balanced my skin more and I have less frequent breakouts. A little goes a long way and it combines with the revitalizing lotion well in the winter. I received my trial size clarifying day oil in the mail and promised myself to try it out consistently until it ran out. I was hesitate since I have already very oily skin. But let me tell you, it has really made a difference. My skin feels soft, the oil production has lowered, and it looks more vibrant and healthy. I can't wait to order more! Thanks Dr. Hauschka. How soft this makes my face feel, is like never before. However...... I understand the concept of like cures like, having studied this and because I don't have an oily face to begin with. It's not the right oil for me, at least not for a long time between use. I picked up a travel size of this oil and within one week my face went from a mess to smooth and clear. I have the typical older, but still combination oily/dry. The biggest change was that it totally flushed out my pores which were very congested from having what i can only describe as elephant tough skin. Oil dissolves oil and dirt as they describe. The day oil works well to control oil and dryness on the cheeks and nose areas. This clarifying oil feels so hydrating. This oil goes on smooth and has quite a pleasant smell as well. I used to breakout a little every month and now I do not see any breakouts. I do need to mix with the revitalizing day cream though in the winter months for dry spots on my cheeks. I used Clarifying Day Oil many years ago to address my blemish-prone skin and had great results. I still have an oily T-zone, have again begun using Clarifying Day Oil mixed with my moisturizer to effectively address it, and it’s working perfectly! For anyone with oily skin who is afraid of using a facial oil, don’t be. Clarifying Day Oil is THE most effective treatment for dealing with oily, congested skin. It’s a miracle in a bottle! A must have for oily skin! I was hesitant about putting oil on my already shiny/greasy face, but let me tell you this product works! After about 10 minutes my skin was calm and less oily. I did my usual makeup routine and I went about my day with confidence and did not even need to re-apply my powder. In the winter when my face is dry on my cheeks I mix a little of the rose day cream in and it is the most wonderful feeling on my skin-smooth and silky- and the dryness disappears! Having combination/blemish-prone skin, I was baffled at the notion of moisturizing with OIL!!! But my skepticism completely waned after a couple weeks of regular use. Now my skin always feels moisturized, and breakouts are less frequent and more manageable when they do occur. The formulation is so light and absorbs very quickly, so I never feel greasy. If you have blemish-prone skin and are skeptical as I was, don't hesitate with this product. It's one of those things you never know how much you need until you use it. Seriously, if this product was discontinued tomorrow, I don't know what I'd do. It's been a complete game-changer for my skin. My skin has never looked so healthy as with this oil! I've run the gamut of oils and have never struck any combination that works like this. It leaves my skin almost matte but moisturized with the healthiest glow and smooth as silk. This product makes my skin look so healthy, doesn't make me breakout and it lasts forever. I will never use anything else, oil for oily skin, who would have thought?! Definitely one of my favorite Dr.Hauschka products. My daughter loves this for break outs. Clears them much quicker! This is a must-have product for me. A small amount goes a long way and helps my combination, blemished skin look and feel so much better.... and has improved overall since using clarifying oil regularly. I have a sensitive combination skin, which used to be very oily, but has been getting dry with age and has started to show some early signs of aging. Depending on the state of my skin on any given day, I would sometimes use this product instead of a heavier moisturizer and also at night. It goes on easily (you only need a few drops, otherwise you would end up with a greasy residue), improves the complexion, and moisturizes the surface of the skin. The only reason I am not giving it 5 starts is because I did not really see any significant improvement in the condition of my skin, unlike with the other Dr Hauschka products I've tried, but the product might not be exactly well-suited for my skin type. I have pretty oily skin, and this oil counteracts it amzaingly. Feels clean, and smells great. I describe my skin as "finicky." It can be sensitive, dry, oily, who knows what, depending on the hour. 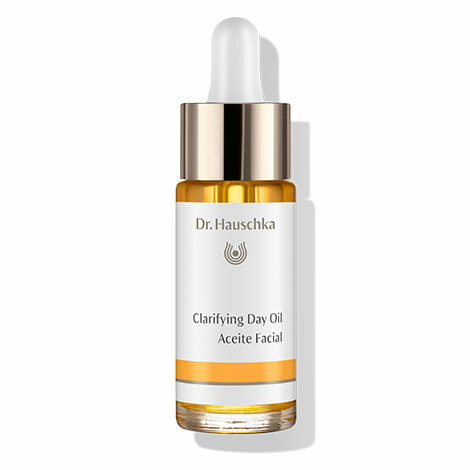 In general, Dr. Hauschka products have been amazing, but the Clarifying Day Oil is one of my must-haves. It does an amazing job of balancing my sometimes dry, sometimes oily skin. It makes my combination skin more oily. This oil smells really good and feels good going on the skin. I don't think it worked as well as I hoped as a moisturizer but I only used it twice. Maybe it's a product you have to use for a while before seeing a difference. Give it a try. This oil helps tremendously with my clogged pores and blackheads. Plus, my skin feels so smooth and supple after using it. I definitely recommend it! At first, the thought of putting an oil on my already oily face sounded crazy. But I'm SO glad I tried this product! I mix a few drops with my Rose Day Cream every morning, and it somehow makes my face feel less oily and reduces redness in my skin. I have sensitive combination skin, and this stuff is amazing. It absorbs quickly and doesn't leave you looking oily AT ALL! I highly recommend trying it, especially when mixed with a day cream that you like. I tried out the clarifying day oil after watching a YouTube video from a woman who swore by Dr. Hauschka's products, especially this product. I get adult acne from time to time and have very oily skin, so I tried out the small size first and I started seeing results by the first day! I was so impressed and I just ordered the full size of this oil! Thanks for a great product! The Clarifying Oil has been amazingly beneficial for my skin in many ways. I use it at night and it reduces the daytime oil production, reduces any type of dark spots, & reduces wrinkles. Each morning after cleansing and toning, apply 1-3 drops evenly to the face, neck and décolleté with a gentle pressing motion. For maximum benefit, apply while skin is still moist from toner. For blemished combination skin with sensitivity, use Melissa Day Cream or mix a small amount of Revitalizing Day Cream in the palm with 1-2 drops Clarifying Day Oil, then gently apply to the skin (avoid the eye area). For sensitive, reddened skin combine Rose Day Cream with Clarifying Day Oil for soothing protection against harsh weather. Clarifying Intensive Treatment can be used seasonally or as needed.